LAST BOAT TO YOKOHAMA: The Life and Legacy of Beate Sirota Gordon, by Nassrine Azimi and Michel Wasserman. The story of one of the most incredible women of the 20th century, who at age 22, secretly helped write Japan's new constitution, personally demanding the inclusion of an article requiring gender equality. With an afterword by Supreme Court Justice Sonia Sotomayor. 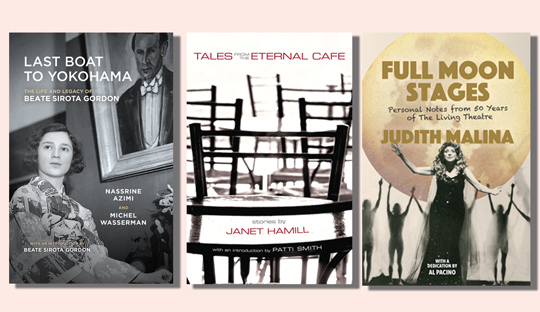 TALES FROM THE ETERNAL CAFE: Stories by Janet Hamill. Compelling fiction with brilliant characters, exotic locations, and emotional resonance. Publishers Weekly Best Books of 2015. Introduction by Patti Smith. FULL MOON STAGES: Personal Notes from 50 Years of the Living Theatre, by Judith Malina. An insiders look at one of the most influential avant-garde theatre companies of the 20th century, with more than 50 archival photos and a preface by Al Pacino. Sale ends March 31. Must be purchased through our rather lovely online store. We hope you pay a visit soon!Three Rooms Press website store.